Omaha has a peculiar relationship to architecture. With the recent fire at M’s Pub, the dogmatic preservationist discourse surrounding the Specht building, and ConAgra’s departure resurrecting the Jobbers Canyon debate; rigorous conversations about architecture are at a fever pitch. But between these moments of tension and trauma, where is the public’s sustaining appreciation and support for all types of architecture in Omaha? Capable of similar emotional extremes, the architectural style and severity of Brutalism presents a case for collective discourse in architecture and lasting momentum. Yet, ironically, at least in Omaha, these monumental buildings are often over looked. To re-examine the effect of this international style and its imprint on Omaha’s urban-scape, four striking examples of Brutalism in the mid-downtown area between 22nd and 15th streets and Dodge and Leavenworth are explored below. They include The Omaha Police Headquarters, the Omaha Fire Department’s Central Station, the Continental Trailways Bus Terminal and the former Farm Credit Parking Garage. Each urbane structure adheres to and is defined by the austerity of the architectural movement. Descriptions include defining facts on location and construction pulled from the archives of the Omaha World-Herald, Omaha Public Library, and the City of Omaha public records/GIS; as well as subjective remarks. Brutalism descended from modernism in the early 1950’s and is most emblematically found in stark, raw, repetitive structures built through the mid 1970’s. Brutal architecture celebrates architect Louis Sullivan’s mantra that “form (ever) follows function”. This ideology was translated into “honest” designs where the exterior was a reflection of the interior/an expression of use. The stark, minimalist style became a blueprint for new utopian visions. It is no coincidence that many civic architectures and public housing projects built during modernism were designed in this style. What governmental agency would not want to appear as both sincere and forward thinking? Re-looking at these structures through the removal of biased blinders can re-establish a sense of optimism in architecture and a hope that architecture can change the world. The first building on our tour is the Omaha Police Headquarters located at 505 South 15th Street. Designed by Leo A. Daley and constructed by Hawkins Construction Company, the structure was completed on June 06, 1970 for $3,500,000. The Douglas Country GIS pin number is 0315640000. While the façade is the most obvious attribute of the Police Headquarters, the micro detailing is stunning. Simplistic detailing and pronounced joints manifest the “modern lines” articulated in the original schematic. Each corner stacks like LEGO in a macro rectilinear pattern. The juxtaposition of a white matte grid over an opaque black glass structure promotes a secure feeling necessitated by the headquarters of the Omaha Police Department. The weight of the structure is ominous, yet the iconography of concrete framework creates crevices where light and shadow play in the cerulean sky. In a perfect balance of weight and light the building floats on skinny pilotis (support piers) reminiscent of Le Corbusier’s Villa Savoye. The architectural motives of the project were “a complete change from the old stone fortress,” yet as bunkertecture.tumblr.com states, “the buildings [was] so oppressive-looking that it was renovated in 1992.” As time went on, patriotic bric-a-brac have been added to the site complicating, like the Vietnam Veterans Memorial in Washington DC, the design of this modern building. The Omaha Police Headquarters is a premier example of post-war architecture in Downtown Omaha. 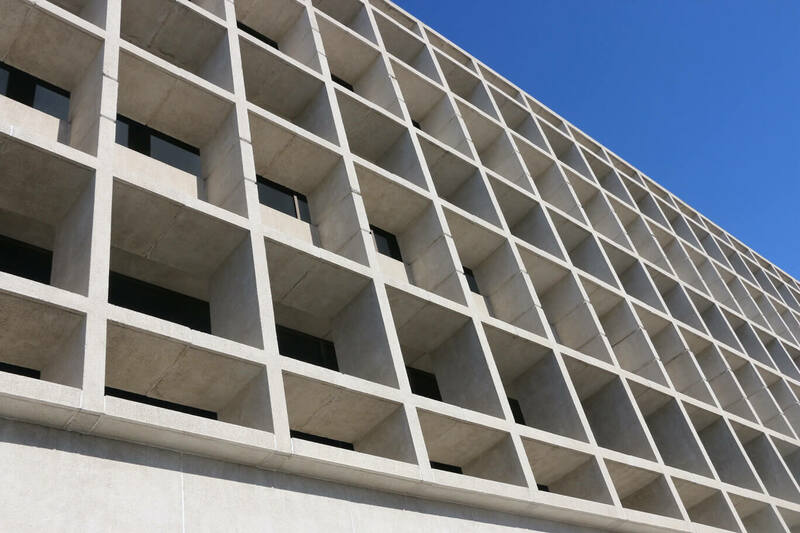 Designed and fabricated with Brutalist tendencies: heavy attributes, civic duties, and concrete; simplicity certainly does not equate to mediocrity. Our second example is the Omaha Fire Department’s Central Station located at 1516 Jackson Street. Designed by Henningston, Durham, and Richardson Inc and constructed by A. Borchman Sons Company, the building was completed on March 20, 1967 for $1,800,000. The Douglas County GIS pin number is 0315710000. The Central Station is an arrogant building. When it was opened in 1967, it closed three older firehouses and was heralded as “the largest and most modern fire department in the country (at that time).” Yet, it is also one of the softer examples of Brutalist architecture listed here. The two-story concrete monolith sits as a two coordinating layers. The top, a smooth finished concrete, the base with a rough exposed-aggregate edifice stand like an Imperial Walker from Star Wars. Rifle shot windows protrude from the second floor, creating dramatic shadows. The chunky base angles gracefully to the upper story. This station house is a modern spaceship ready for a starring role in a Sci-Fi movie. Brutalism’s utopic mission of better living through architecture is a clear match in the Fire Station. Simple design re-defines the speediness of fire and rescue. The current mission of the Omaha Fire Department include a rather modernistic a line stating, “the members of our department hold themselves and each other to a high ethical standard, with integrity, professionalism, and compassion being at the core of every decision we make.” Modernist ideals and in particular Brutalist methods continue to coalesce in form as an expression of use. Building number three is the Continental Trailways Bus Terminal located at 1601 Jackson Street/604 South 16th Street. Constructed by Four States Reality Company, Inc, it was completed on May 05, 1976 for $400,000. The Douglas County GIS pin number is 1532170000. With rounded corners and a vertical ribbed armature, the one-story bus terminal elegantly sits as a bombastic bunker. Two concrete buildings straddle the site as a large super-flat plane unabashedly is plopped on top. Creating the bus loading area, the concrete plane is the space defining architectural element yet it teeters between two boulders like Stonehenge. Below, a cavernous void awaits bathing in simplicity. The rhythmic structure is punctured by hidden vestibules and deep shadows. The bus terminal is perfect in scale and proportion, and ready for the modern age. However, according to architecture critic Charles Jencks, “Modern architecture died in St Louis, Missouri on July 15, 1972, at 3.32pm (or thereabouts)” with the planned destruction of the Brutalist housing complex Pruitt Igoe. With that though, Continental Trailways Bus Terminal represents an interesting transition from modernism to post-modernism articulated in a curvaceous point-of-view. Last, but not least on our tour is the Former Farm Credit Parking Garage located at 2023 Douglas Street. Designed by Boyer + Biskump Architects and constructed by Hawkins Construction Company, the structure was completed on December 01, 1970 for $2,750,000. The Douglas County GIS pin number is 0745340002. While it may seem superfluous to congratulate the design of a parking garage, this facility is arguably among the best examples of architecture in Omaha. When it was constructed, this parking facility was marketed as “Omaha’s most modern public parking facility.” The 550-stall, 14-level automotive container was “specifically designed to make parking easy and fast.” It stands monumentally simple. This is a massive object. There are 7,000 cubic yards of concrete making up the board formed structure, yet the subtle details are impeccable. The South side has a bisecting express ramp that cuts through the repetitive web. Light filters in, narrow stairs shuffle pedestrian traffic upwards, and a seven-story stair shaft rises into the sky like an homage to Le Corbusier’s Unité d’Habitation. There is dynamism to the undulating push and pull of each ascending level. The structure is hiding nothing. It is an amalgamation of everything brutal about Brutalism. This parking garage sits as an architectural marvel, a beacon for modernism. Architecture is the cornerstone of the built environment. Yet, Omaha risks not really caring about architecture and its cultural as well as functional role. Seen in context, Omaha’s Brutalist architecture has radical charisma. Four distinct buildings; Omaha Police Headquarters, the Omaha Fire Department Central Station, the Continental Trailways Bus Terminal, and the Former Farm Credit Parking Garage prove there is a lot to appreciate from Brutalism’s utopic tendencies. Omaha’s Brutalism is deliberate in approach, and it re-defines its built context with clean lines and modern structure. Architecture in and of itself does not have a narrative, and it exists beyond the circumstances in which it was built. Architecture must be considered in relation to its environment and the effect it has on the human experience, namely it must be both seen and occupied. Utopic, historic, or contemporary, all of Omaha’s architecture deserves a place at the forefront of our discourse.